Octogenarian senior citizen actor, writer, and director Tom Skerritt was born on August 25, 1933 in Detroit, Michigan. Skerritt told Film Comment that shortly after graduating in 1951 from Mackenzie High School in Detroit at the age of 17, he enlisted in the U.S. Navy for a four year tour. Although the Korean War was on, Skerritt was stationed in the U.S. during his tour as an airman and learned to fly (although he was not a pilot). 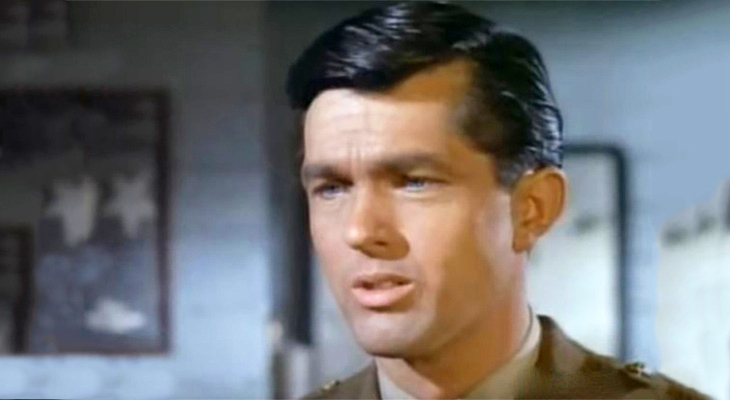 Below, Tom Skerrit as a WWII pilot in the 1960s's TV series 12 O'Clock High. Courtesy of the G. I. Bill, Tom Skerritt began attending Henry Ford College in Dearborn, Michigan in 1956, then transferred to Wayne State University. He married Charlotte Shanks in 1957, and they moved to California when he transferred again to UCLA as an English major in 1960. Charlotte and Tom Skerritt's son Andy Skerritt was born in 1962. Tom Skerritt had begun appearing in local productions, and was focused on a career in directing and writing - but in 1962, in his last semester at UCLA, he dropped out to appear in the Korean War movie War Hunt (1962). Many of the small cast of War Hunt went on to long and distinguished careers in film (television and the movies) - Robert Redford and John Saxon; as well as Sydney Pollack, Gavin MacLeod, and Tom Skerritt. Although they didn't see each other often due to their busy work schedules and young families, Tom Skerritt and Robert Redford maintained a friendship after filming War Hunt due to their mutual interests in acting, directing, and nurturing independent film making. More acting jobs came his way, and with a wife and family to support, Skerritt had to put his dreams of directing on hold, although he never gave up writing. Charlotte and Tom Skerritt's daughter Erin was born in 1964, and son Matt in 1969. Although he appeared in a few movies during the 1960's and 1970's, most baby boomers and seniors will remember seeing Tom Skerritt in one of his many appearances on episodes of popular TV series of the era, such as My Three Sons, Hawaii Five-O, S.W.A.T., and Baretta starring Robert Blake. The Alfred Hitchcock Hour (1963), in an episode that also featured John Gavin. My Favorite Martian (1964) starring Ray Walston, with Marlo Thomas in a guest spot. 30 years later, Ray Walston and Skerritt would work together again on his 1990's TV series Picket Fences; and 40 years later, Marlo Thomas and Tom Skerritt both guest-starred as judges on the same episode of Law & Order: Special Victims Unit (2004). On an episode of Mannix (1967) starring Mike Connors titled Warning: Live Blueberries, Tom Skerritt and members of The Buffalo Springfield band (Stephen Stills, Neil Young, Richie Furay) also appeared. The episode title The Knot on the western TV series Lancer in 1969 also guest-starred Martin Sheen. Martin Sheen and Tom Skerritt would both appear in the 1983 thriller The Dead Zone, and Skerritt guest-starred as Senator Chris Carrick on an episode of Martin Sheen's TV series The West Wing in 2004, 35 years after they first worked on Lancer. Tom Skerritt, Mickey Rooney, Barbara Feldon, Susan Saint James, and Alan Oppenheimer all appeared on the same 1970 episode of The Name of the Game. Tom Skerritt appeared on Bonanza for the first time in 1964. When Skerritt guest-starred on an episode of Bonanza again in 1973 as Corporal Bill Tanner, Tim Matheson was appearing in a recurring role as Griff King. Combat! - Tom Skerritt appeared on Combat! 6 times between 1962-1967. Death Valley Days - 5 episodes between 1963-1968. Right, Tom Skerritt on Death Valley Days. Gunsmoke - 5 appearances on Gunsmoke between 1965-1972. Cannon - On the 3 episodes of Cannon between 1971-1975 that Tom Skerritt appeared, some of his guest co-stars included Vincent Van Patten and Paul Michael Glaser. The Virginian - Tom Skerritt made 6 appearances on The Virginian between 1962-1971. 12 O'Clock High - 5 appearances between 1964-1967; starring Chris Robinson, Paul Burke, and Robert Lansing. Other guest stars in the episodes of 12 O'Clock High that Tom Skerritt appeared in included Beau Bridges and Bradford Dillman. 45+ years later, Tom Skerritt and Beau Bridges both appeared on the same episode of White Collar (2012). 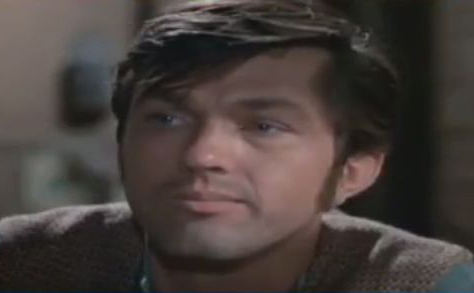 A few of the movies that Tom Skerritt appeared in during the 1960's include the drama One Man's Way (1964) starring Don Murray, and the western Those Calloways (1965) starring Brian Keith, with Linda Evans in the cast. In the Korean War comedy MASH (1970), Tom Skerrittt co-starred as Duke Forrest, along with Donald Sutherland, Elliott Gould, Sally Kellerman, and Robert Duvall; both Skerritt and Robert Duvall had appeared in the same episode of Run For Your Life a couple of years earlier in 1968. Below, in a clip from MASH, Tom Skerritt, Elliot Gould and others are listening in as Margaret "Hot Lips" has a tryst with Frank Burns. During the early 1970's, Tom Skerritt's movies included The Wild Rovers (1971) with Ryan O'Neal and Joe Don Baker. He appeared as Det. Bert Kling in Fuzz (1972), a police procedural movie based on the Ed McBain 87th Precinct series. Skerritt's co-stars in Fuzz were Burt Reynolds, and Raquel Welch as Det. Eileen McHenry. In 1972, Charlotte and Tom Skerritt were divorced after 15 years of marriage. According to an article in The Seattle Times, Charlotte had developed a mental illness and for much of the previous decade Skerritt had struggled with working and trying to be the caregiver for their 3 young children; he often brought his children on set with him. Keith Carradine and Tom Skerritt co-starred in two movies in 1974 - the crime drama Thieves Like Us (1974) with Louise Fletcher, and the crime comedy Run, Run, Joe! (1974). That same year, Tom Skerritt appeared in another crime comedy - Big Bad Mama (1974), starring Angie Dickinson, William Shatner, and Sally Kirkland. The next year, William Shatner and Tom Skerritt were again both in the cast of the horror film The Devil's Rain (1975) along with John Travolta. Tim Matheson (Bonanza), Barbara Rush (Peyton Place), and Tom Skerritt appeared in the Richard Widmark western The Last Day (1975), along with Robert Conrad, Richard Jaeckel, and Loretta Swit (his co-star from MASH). Tom Skerritt told The Seattle Times that he married his second wife Susan (Sue) Aran in Rome in 1976; their son Colin was born in 1978. During the early years of their marriage Sue and Tom Skerritt had homes in the Santa Monica Mountains and in British Columbia. In the latter half of the 1970's, Skerritt co-starred in the romantic drama The Turning Point (1977) with Shirley MacLaine. He also appeared in the stoner comedy Up in Smoke (1978); the romantic drama Ice Castles with Robby Benson; and the TV action movie Maneaters Are Loose! (1978) with Diana Muldaur and Dabney Coleman, who had been in the same TV episodes as Tom Skerritt of Death Valley Days (1968) and the Fugitive (1965). Tom Skerritt's biggest movie role of the 1970's was that of the starship captain "Dallas" in the sci-fi monster (literally) hit movie Alien (1979) co-starring Sigourney Weaver, John Hurt, Harry Dean Stanton, and Yaphet Kotto. Alien brought in more than $203 million dollars and was made on a budget of just $11 million. Below, Tom Skerritt, Ian Holm, Harry Dean Stanton, Yaphet Kotto, and Sigourney Weaver are featured in a movie clip from Alien.